A well circumscribed round to ovoid solitary unilocular mucine containing third ventricular cyst. CC contributes to 0.5-1.0% primary brain tumors and 15-20% intra ventricular masses. 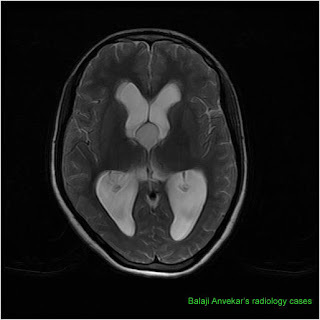 Location is a diagnostic clue, more than 90% occur at Antero Superior corner of third ventricle at foramen Monro. In less than 1% of cases other sites are lateral ventricle and fourth ventricle. Size variable from few mm to 3cm. Density on CT and signals on MRI variable. Density correlates inversely with hydration state. 1/3rd are iso to hypodense. Signal on T1W images correlates with cholesterol concentration. Signal on T2W images correlates with water content. Majority isointense to brain on T2WI, Hypointense cysts are uncommon indicate high viscosity of cyst. Hyper intense on FLAIR due to failure of signal suppression owing to its mucin content. No restricted diffusion on DWI. Usually doesn't enhance on post contrast T1. CC develop from embryonic endoderm, not neuroectoderm similar to other foregut-derived cysts like neurenteric, Rathke cleft cyst. Ectopic endodermal elements migrate into velum interpositum. Contents accumulate from mucinous secretions, desquamated epithelial cells. Microscopic Features are outer wall composed of thin fibrous capsule. Inner lining composed of simple or pseudostratified epithelium, interspersed goblet cells, scattered ciliated cells. Rests on thin connective tissue layer. Cyst contents is PAS + gelatinous ("colloid") material, variable viscosity, +/- Necrotic leukocytes, cholesterol clefts. Electron microscopy, resembles mature respiratory epithelium, Non-ciliated or tall columnar cells, Basal cells contain dense core vesicles. Headache is most common symptom. Less common are nausea, vomiting, memory loss, altered personality, gait disturbance, visual changes. Acute foramen of Monro obstruction may lead to rapid onset hydrocephalus. Presence of growth, rate of growth and development of CSF obstruction varies. 90% stable or stop enlarging if diagnosed at older age, cyst is smaller in size and already Hyperdense on NECT, hypointense on T2w MRI. Requires no treatment if asymptomatic except close follow up. Complete surgical resection is treatment of choice. Image-guided endoscopic approach increasingly common. Recurrence if resection is incomplete. Stereotactic aspiration is difficult if content is extremely viscous / solid. Imaging features that may predict difficulty with percutaneous therapy are if its Hyperdense on CT and hypointense on MRI T2WI suggests high viscosity of the cyst. Reference : Osborn Diagnostic imaging.